LOW_RIDER: NEW! A new windsurf specific outline, designed to stabilise and distribute the load evenly across the back area. WOMEN ́S X_SPINE: NEW! Specifically designed for women, the new Women’s X_Spine is a thermo moulded EVA protection that protects the back without stiffening the harness. 3D CONTOUR SHAPE: A technique specifically designed to provide a perfect fit and support to the upper and lower part of the back through differently shaped segments of the harness. EXTENDED SOFT_EDGE: NEW! A new, extended soft edge that bends sideways at the hips and ribs for a more forgiving feel, enhanced by a special foam padding. SLINGBELT: The new Slingbelt provides a comfortable embrace around the waist, keeps the harness in place, and eliminates friction or irritating pressure points. WRAP TEC: Pre-shaped construction that allows the harness to wrap perfectly around the body, offering additional support. HANDLE PASS LEASH SLIDER: Slim slidingtube to connect with the handle pass leash. New end-stopper fittings. PUSH BUTTON SPREADER BAR: Safe and easy release system for the spreader bar. BELT GARAGE: New neoprene pockets cover buckles with a protec- tive rubber patch, giving slick and easy storage of excess webbing. 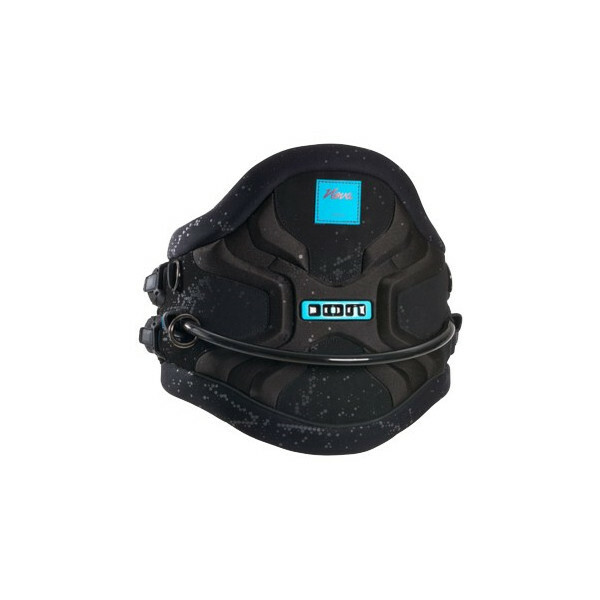 PROTECTION PAD: The world’s first, fully moulded protection pad for the Spreader Bar, ensures a light weight feel, less water absorption and comfortable cushioning. KITE KNIFE: Safety knife to cut the kitelines in dangerous situations.